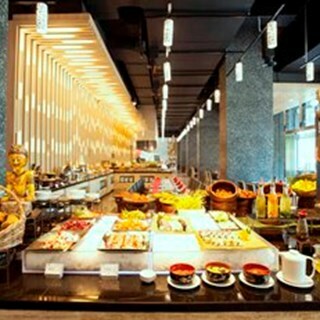 Catappa Restaurant Luxurious and glamorous restaurant design in providing your comfort and enjoyable place to celebrate your unforgettable moment. 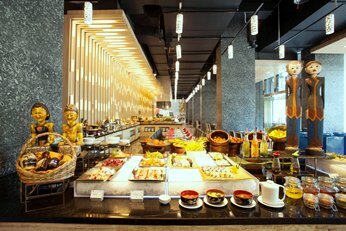 The restaurant is Located on the ground floor, lobby area and it's view toward to beautiful modern garden landscape with 300 seating capacity, grand space and elegant buffet concept and variety of food and beverage ala carte with excellent healthy and delicious. Come and enjoy our best dishes. I was dining a la carte at Catappa. To my surprise all of the food was a disappointment. I was ordering tomatto soup with basil, the taste was just okay. The rib eye was terrible at first. I was ordering rib eye medium well with black sesame sauce. But what I got was well done super salty sauce. Yes, they responded very well with my complain. And exchange it immediately, how ever they gave an explanation like I have never eaten a medium well steak before,and stated the one before was medium well. The exchanged steak was also just okay. I think I could name dozen those are better than this one. When I was about to pay my bill. One of the waiter gave me a suggestion that I should try to chose a buffet for my next visit, or should try the lounge if I want to dine an ala carte. I think you all have given me a firm excuse to never return. So thank you. By the way the atmosphere was superb. Just don't dine the ala carte. great restaurant, and all staff is very helpfull, very rommended this restaurant, the ambiance is great. Nice Dinner! Delicious. The atmosphere is luxury and the staff is so friendly.